Since the dawn of YouTube, we’ve been sharing the hours of video you upload every minute. 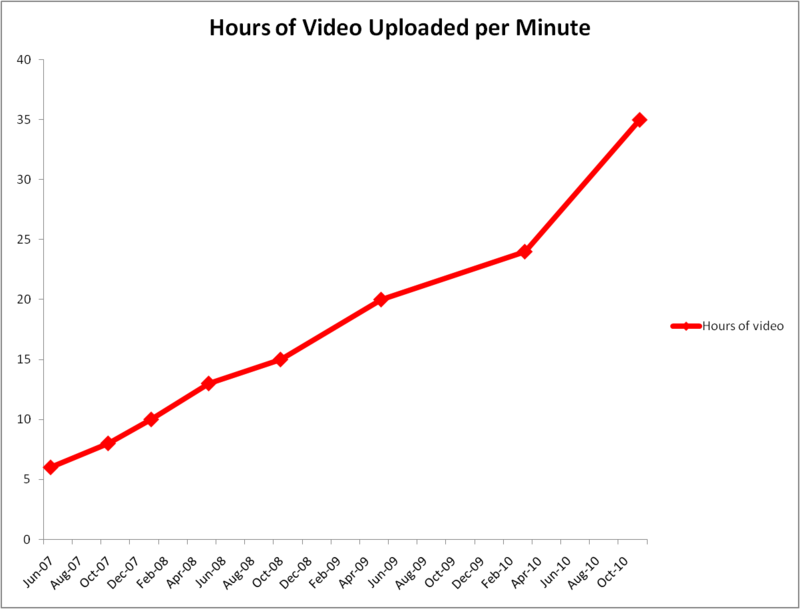 In 2007 we started at six hours, then in 2010 we were at 24 hours, then 35, then 48, and now...60 hours of video every minute, an increase of more than 25 percent in the last eight months. In other words, you’re uploading one hour of video to YouTube every second. Tick, tock, tick, tock — that’s 4 hours right there! For all the hours of video you’re uploading—you’re watching more as well; we’ve now exceeded four billion video views globally every day. That’s up 30 percent in the last eight months and the equivalent of more than half the world’s population watching a video every day, the same number as there are US $1 bills in circulation, the same as number of years since there was water on Mars...it’s a big number, and you’re making it bigger every day. War must end. Competition must end. Waste must end. Peace must begin. Cooperation must begin. Bounty must begin. Individual exploration must begin. Colonization of space must begin. Capitalism must end. Poverty must end. Greed must end. Selflessness must begin. Equality must begin. Compassion must begin. Being rich must end. Being poor must end. Premature death must end. Clean free energy must begin. Naturalism must begin. It would be interesting to get a % breakdown of how many of the views are from embedded YouTube website videos. I have been helping my clients at makinggreatideashappen.com understand how simple it now is to prepare a relevent video, load it and maintain it on YouTube and then embedded it into their website. How many HDD space using YT on this all vids? holy nyan how many hard drives!